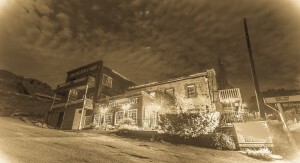 Halloween Ghost Tour at the Gold Hill Hotel tonight! The Gold Hill Hotel (as seen on Ghost Adventures and proclaimed the 8th most haunted location in Nevada) is offering Halloween Ghost Tours during the month of October! October 29th is tonight’s tour! These tours benefit The Comstock Foundation for History and Culture. Hosted by the Northern Nevada Ghost Hunters (NNGH), your evening will start with a gourmet dinner in the Crown Point restaurant (one of the best restaurants on the Comstock). After dinner, NNGH will guide you back in time with tales of the history and the hauntings of the hotel and the surrounding area, known as Slippery Gulch. Using ghost hunting tools and techniques, you can try to make contact with the spirits still in residence at the hotel. Please note that you will be touring some of the actual haunted rooms in the hotel as well! Afterwards, quench your thirst or calm your nerves with a drink in the 150 year old bar, as frequented by Mark Twain back in the day! This is sure to be an evening to remember. Come join us! Dinner and Tour – only $40.00 per person. Dinner is at 5:00, 5:30 or 6:00 p.m. and the tour starts at 7:00 p.m.
Tour starts at 7:00 p.m. If you are having dinner with us, what time would you like to dine? 5:00 p.m.
Who’s ready for A Haunting on the Comstock Hills, a benefit for The Comstock Foundation for History and Culture?